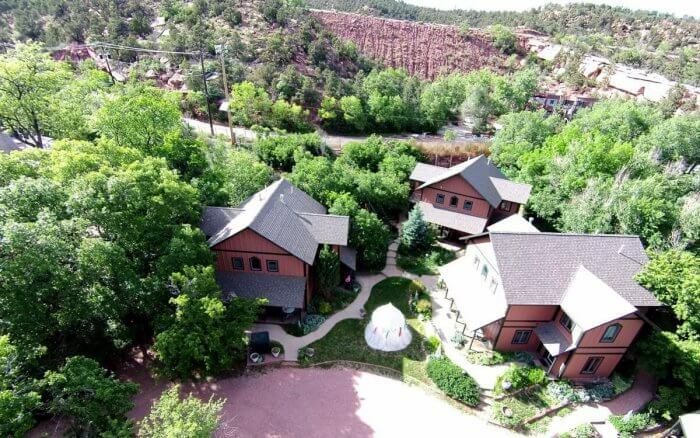 Just six miles west of Colorado Springs, discover Blue Skies Inn, a unique Colorado Bed & Breakfast. 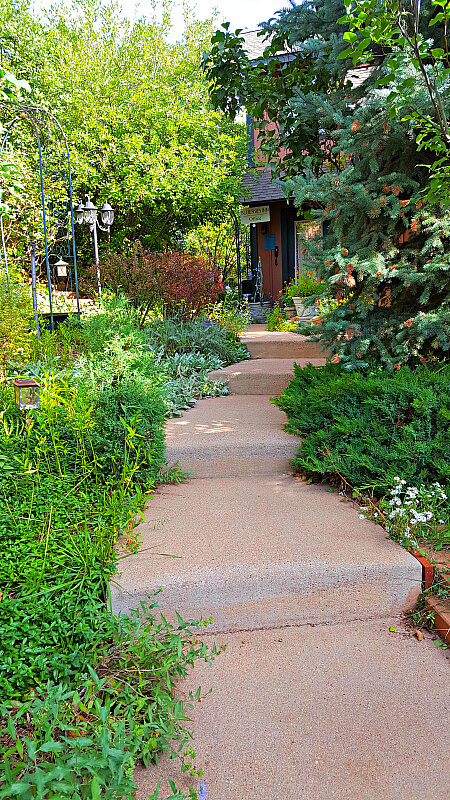 Tucked inside a 2.5 acre property minutes from downtown Manitou Springs, here you’ll discover what B&Bs should be. 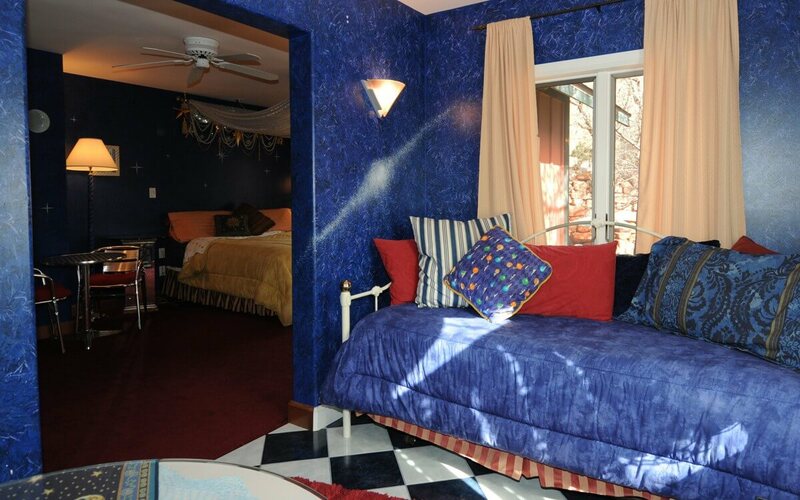 Choose from 10 Hand-painted and uniquely themed rooms, meandering paths, enticing gardens, and warmly welcoming innkeepers — and best of all guests are minutes from local attractions; this is what Blue Skies Inn is all about. It was another Colorado road trip for me and a girlfriend. This time, our destination was the debut of the epic AdventureFest at the Royal Gorge Bridge & Park in Canon City. But I wanted to extend my weekend outdoor adventure with a stay in Manitou Springs, although a little out of the way (hello Garden of the Gods!). First stop on this Colorado getaway was to check in at the Blue Skies Inn en route to Canon City. A scenic 90-minute drive from west metro Denver brought me to Manitou Springs. My last visit a couple of years ago included a stay at the historic Cliff House at Pikes Peak. I’m already a fan of Colorado B&Bs. Since I had a full day planned in Canon City (55 miles southwest), I preferred to check in early as we’d return in the evening when navigation can be challenging. And was that ever a great choice. Although Blue Skies Inn is on the main street of this Colorado mountain town, the property is on a quiet corner near the visitor’s center and easy to miss. The art begins on Main Street (Manitou Avenue) with an arched “Blue Skies Inn” sign marking the entrance to the bed and breakfast. Since the sign is only seen when exiting the town, we made the right decision to check in before our Canon City adventure. Once you turn at the sign, continue driving into the scrub and tree protected bed and breakfast, and you’ve entered your Colorado oasis. We followed the signs to the office, parked our car, and then walked toward the office. As a young adult, life and love took Sally to the East coast, but her heart stayed in Colorado, ultimately unable to resist the call of the mountains in the Colorado Rockies. Sally’s search for the perfect house and artist studio resulted in an unlikely match, a 2.5-acre property and home to the Buffalo Bill Wax Museum. 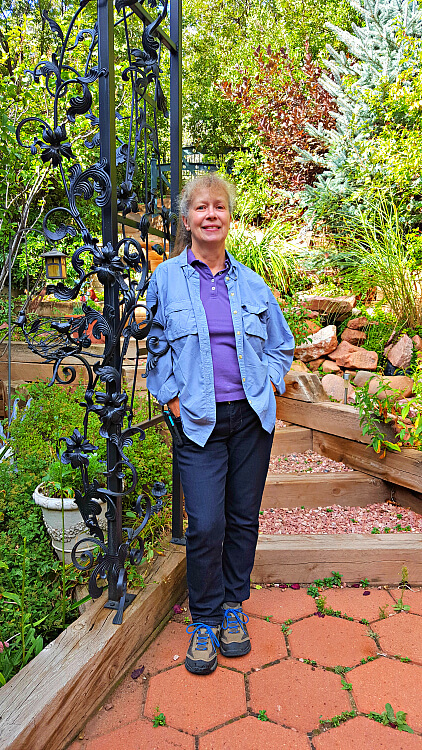 When answering the call of the Rocky Mountains, she thought the scrub-oak hillside was the perfect destination to feed her artist soul…and possibly something more, like a bed and breakfast? That artistic dream turned into a reality when Sally decided to design three new buildings using her artist skills (including experience remodeling an east coast home), staying true to the board-and-batten siding and Gothic Revival architectural style of the on-site Briarhurst Carriage House (now a wedding venue). After being told she needed a contractor’s license to continue, she took the test and became one of the few female licensed General Contractors in the Pikes Peak / Colorado Springs area. You go, girl! 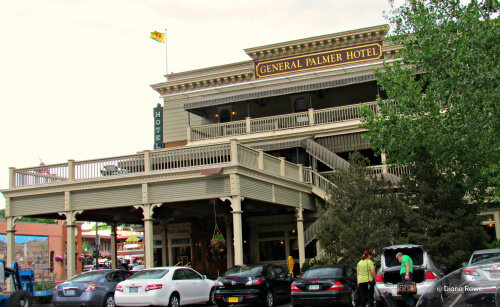 Did we mention this property included the historic 1871 Carriage house, the common area of the Blue Skies Inn, and possibly the oldest standing structure in Manitou Springs? Add in the 10 uniquely designed suites later, and the rest is history. It’s a maze. A garden, foliage edged path to the office. You literally feel like you are entering an oasis away from the hustle and bustle of the world, with its ancient 100-ffoot willows and towering oaks. Windy paths snake around the 3 buildings (although the rooms are located in 2), and flowers and garden waterfalls truly take guests away from it all. As you walk toward the B&B office, look left to the resident hot tub, literally tucked away amongst the foliage (sadly we didn’t have a chance to check it out). Before we could ring the bell at the office, Innkeeper Sally opened the door with a smile. She grabbed the keys and escorted my friend and me to our Blue Skies Inn Starlight Suite, literally just steps away. 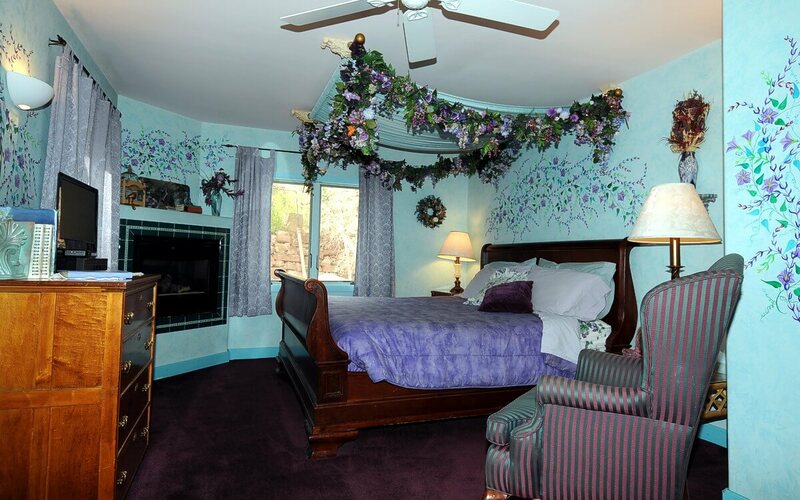 Okay, so the pictures on the Blue Skies Inn website do not do this B&B justice. Seriously. But this is why I feel this is a truly unique Colorado bed and breakfast. Innkeeper Sally is an artist and this is the coolest hand-painted (but perhaps a bit out there) suites. Each room is big, 450 square suite, with plenty of room to spread out. Each suite includes a bedroom, sitting room and bathroom. We stayed in the Starlight Suite, located in the middle building on the second floor. Yeah, there’s a lot of blue, with a big emphasis on the artist’s (Innkeeper Sally) vision of the Universe, including sparkling stars, galaxies, and comets. Gas fireplace — turned off in summer and a whole lot of intraterrestrial nods. 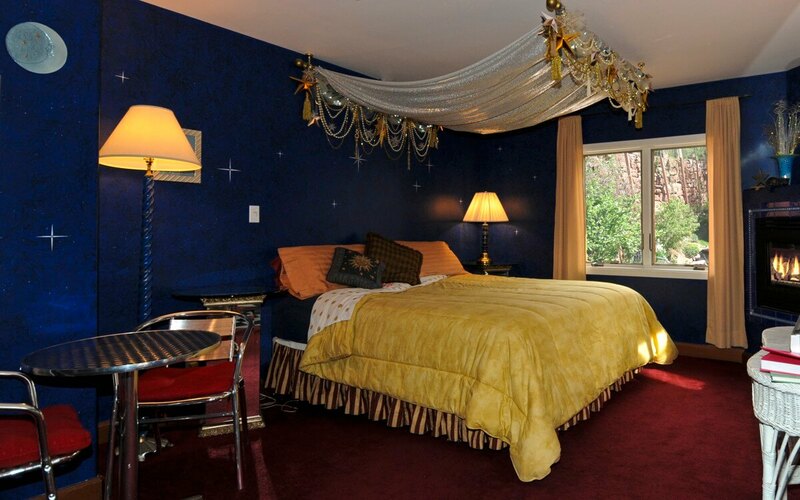 (Look for the sacred autographed photo of David Duchovny by the bedside lamp.) Okay, it may seem over-blue at first, but actually, the decor was relaxing – and I slept like a baby. My Starlight Suite also included an alcove sitting room with a day bed, perfect for our girlfriend getaway. PS the view of the Woodland Garden from the sitting room and its three windows is inspiring and relaxing! We got a peek at the Blue Skies Inn Morning Glory Suite across the hall, equally warm and welcoming, but definitely different! And oh, the bathroom isn’t one of those small, after thoughts, as per usual in an historic hotel. 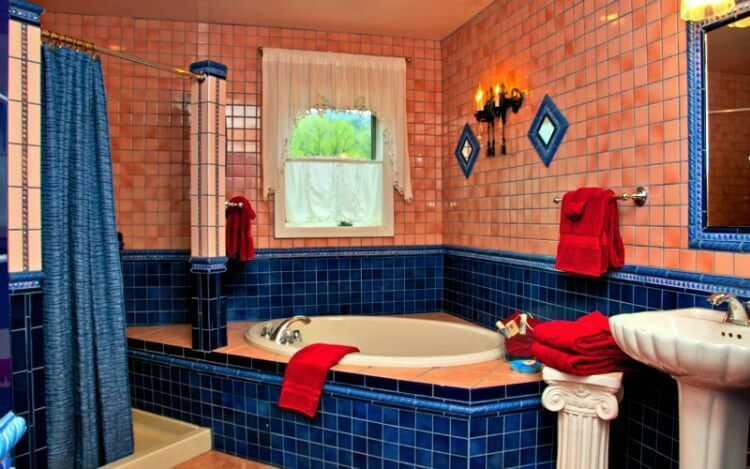 Oh no, this cobalt blue (go with the theme) mirrored bubble-bath soaking tub built for two and double-headed walk-in shower. And yes I lingered in that double-headed, massage-like shower until the water turned cold — no judging please! Yes, it is a bed and breakfast, but the presentation is oh-so-amazing. A ful hot breakfast is included in your very affordable room rate. 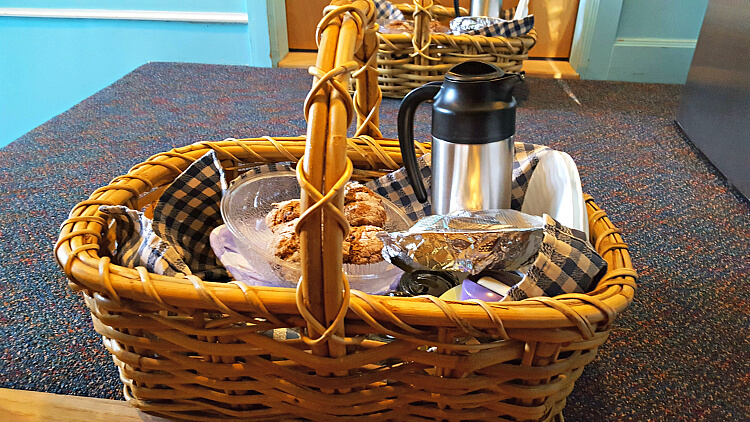 A hot egg dish (which I LOVED but my girlfriend not so much), freshly baked muffins, fresh fruit, juice, coffee, butter, and milk are DELIVERED to your door in a picnic basket! Talk about pampering! Choose from two delivery times 8:00 or 8:30 am. Take your amazing breakfast to your in-suite or bring the picnic basket to one of the many outdoor tables. Either way, yummy and relaxing breakfast. Within minutes, experience the most amazing Colorado mountain historic hotel at the Blue Skies Inn. Within half a mile, take a hike in the Garden of the Gods, Manitou Cliff Dwellings — and more. Prefer a train experience? Well, then all aboard the Pikes Peak Cog Railway or the Royal Gorge Route Railroad An hour away is the awe-inspiring Royal Gorge Bridge & Park. I’m a big fan of B&Bs (did I mention that? ), and those who don’t understand the value, Blue Skies Inn is the perfect example of why you should stay at B&Bs. 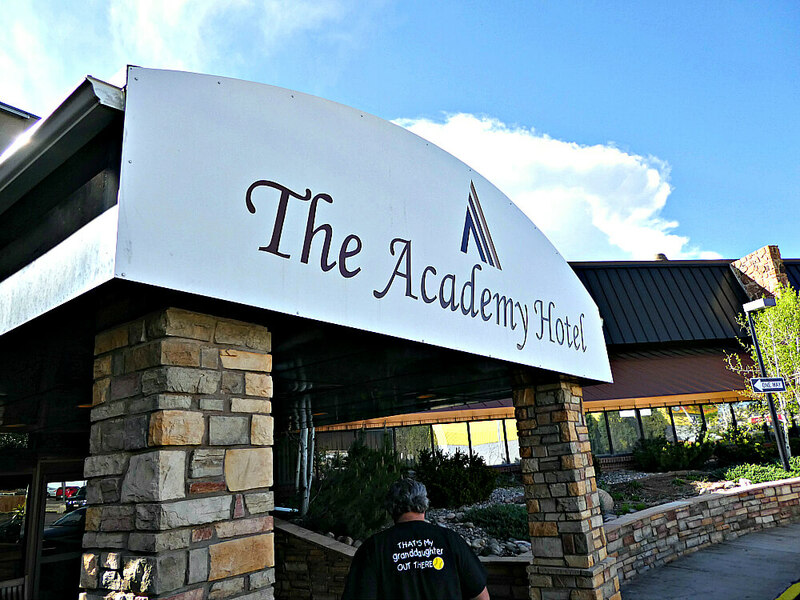 Local insight, secluded and amazingly beautiful hotel in Colorado, and affordable room rates — including breakfast. 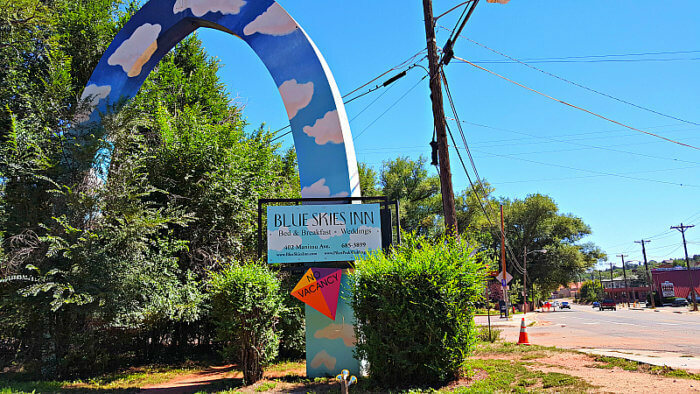 Go ahead and book your stay at the Blue Skies Inn, Manitou Springs — tell ’em Hotel-Scoop.com sent you! Room rates at Blue Skies Inn range from $145 to $240. Accommodations at Blue Skies Inn, courtesy of Visit Colorado Springs, for purpose of a review. Opinions expressed are my own. Photos courtesy of Blue Skies Inn and Diana Rowe.